HARLOW, England, March 22, 2019 /PRNewswire/ -- Haag-Streit UK (HS-UK), the leading manufacturer and distributor of gold-standard optometry and ophthalmic equipment, is looking forward to an exciting Optrafair 2019, at the Birmingham NEC on Saturday 30th March - Monday 1st April 2019. Exhibiting on stand F50, HS-UK will be showcasing a large selection of its product portfolio, including; the gold-standard Haag-Streit BQ 900 LED Slit Lamp with IM 900 imaging module and Octopus 600 perimeter. Other products being exhibited will include the; innovative AngioVue OCT-A and iScan OCT devices from Optovue; CenterVue DRS retinal camera and Eidon AF wide-field confocal scanner. Haag-Streit Academy will be holding three exciting on-stand CET workshops during the show. Attendees are eligible to receive two CET points for each session. Topics include; 'Wide-field, Confocal Multimodal Fundus Imaging', 'Binocular Vision' and a 'Slit Lamp Masterclass'. 'Wide-field, Confocal Multimodal Fundus Imaging' will be held on Saturday 30th March between 10am and 11am and Monday 1st April between 12pm and 1pm. Hosted by Grant Duncan, HS-UK Clinical Training Manager, the session will cover the definition and advantages of confocal imaging, wide-field imaging and the key clinical applications. Each delegate who attends the session will receive a FREE copy of CenterVue's 'Clinical Atlas'. The 'Clinical Atlas' is a 96 page hardcover book featuring a series of interesting clinical cases, collected by retina specialists, that show examples of the Eidon's superior imaging capabilities. 'Binocular Vision' will be run between 2pm and 3pm on Saturday 30th March and between 10am and 11am on Sunday 31st March. Hosted by Sam Laidlaw, HS-UK Product Manager, the session will include understanding common binocular vision conditions and a discussion about practical clinical techniques. The 'Slit Lamp Masterclass' will take place between 2pm and 3pm on Sunday 31st March and between 10am and 11am on Monday 1st April. It is a demonstration workshop which will be facilitated by experienced Optometrist, Kirit Patel, Radlett Opticians, and will cover effective examination of the patient and illumination & magnification techniques. HS-UK sister company IPRO will also be exhibiting on stand F50 and their staff will be on-hand to discuss their innovative practice management software, PASKAL 3D. 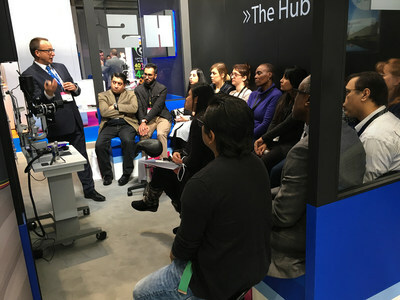 Sharon Mills, HS-UK Marketing Manager, said, "Once again, we have a dedicated education 'hub' on the HS-UK stand at Optrafair, and we would welcome delegates to join us for some very exciting CET-accredited sessions. Our workshops will provide an excellent opportunity to learn from product experts and gain some valuable hands-on experience. In addition, HS-UK's gold-standard optometry equipment will also be available on the stand throughout the show." To register for any of the CET sessions, please visit https://optrafair-2019.reg.buzz/. For further information on the CET sessions, please contact Haag-Streit Academy on 01279 881923, or email academy@haag-streit-uk.com.